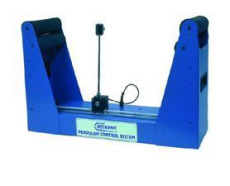 The Pendulum Control System is ideal for students who are studying control engineer. It can function as a stand along analogue control system or, alternatively, it can be interfaced to an external controller such as a PC. The PC control of the unit can be achieved using either Direct Digital Control (DDC) or fuzzy control. This allows the student to compare the performance of the three controllers, analogue, DDC and fuzzy. The Pendulum Control System can be used in two different modes, either as inverted pendulum or as overhead crane.